We’d love your help. Let us know what’s wrong with this preview of Micronations by John Ryan. Bored of visiting the same UN-recognized countries? Ready to explore somewhere unique and perhaps a little wacky? Want to add some really rare stamps to your passport? Then let Lonely Planet's guide to home made nations take you to a bunch of places you've never heard of. Here are countries where the national anthem is the sound of a rock being dropped into water, where th Bored of visiting the same UN-recognized countries? Ready to explore somewhere unique and perhaps a little wacky? Want to add some really rare stamps to your passport? Then let Lonely Planet's guide to home made nations take you to a bunch of places you've never heard of. Here are countries where the national anthem is the sound of a rock being dropped into water, where the currency is pegged to the value of Pillsbury's cookie dough; where the citizens vote in a poodle as president and where if you're lucky, the king will put on a pot of tea when you stop by. To ask other readers questions about Micronations, please sign up. First half was way more interesting than second half. Cool history vs stunts. Could see a tv series based on some if these places. A silly little travel guide those tiny little countries that have been wholly invented by their bored rulers over the last century. The Principality of Sealand gets top billing here, and the countries get less and less legitimate as it goes on from there, until you get to the countries that exist solely online or inside a corgi-owner's caravan. I appreciate the seriousness with which the authors treat these nations. It's presented as a serious travel guide, which every country getting its own Pla A silly little travel guide those tiny little countries that have been wholly invented by their bored rulers over the last century. The Principality of Sealand gets top billing here, and the countries get less and less legitimate as it goes on from there, until you get to the countries that exist solely online or inside a corgi-owner's caravan. I appreciate the seriousness with which the authors treat these nations. It's presented as a serious travel guide, which every country getting its own Places To Eat and Things To See & Do sections. (Accommodations are usually not available inside the micronations themselves) Although trying to parse the self-serious satire to find the reality of the situation can be difficult. (The Kemetian king's motorcade was "attacked" near Chicago) Monarchs are constantly being "overthrown" but it's impossible to know what that means in the small and insular worlds of these nations. As someone who has read my fair share of travel guides , I found this to be an amusing and brief discussion of micro nations, or those claimed states that are often run with a sense of lightheartedness. The scope of the book does not include those nations with legitimate historical grievances, like Somaliland , although at least one of the micro nations stated here did have troubled relations with that state, but rather those nations that have been made up in relatively contemporary times As someone who has read my fair share of travel guides , I found this to be an amusing and brief discussion of micro nations, or those claimed states that are often run with a sense of lightheartedness. The scope of the book does not include those nations with legitimate historical grievances, like Somaliland , although at least one of the micro nations stated here did have troubled relations with that state, but rather those nations that have been made up in relatively contemporary times and that can serve as a source of amusement for those who wish to read about it or travel to such places. I found for myself that I had been to a couple of the micro nations without having been aware of it, and of course those happened to be Floridian micro nations, namely British West Florida and the Conch Republic, and there are a couple of other ones I may have visited accidentally in Baltimore and the Pacific Northwest. As is the case with many aspects of life, even the lightheartedness of these discussions has some serious elements as well. The contents of the book are straightforward and topically organized. The introduction of the book discusses the locations and scope of what the editors consider to be micro nations, as well as how and who starts these projects, mostly men with particular liberal or libertarian political mindsets. The first part examines serious micronations that have adopted the trappings of nationhood despite their lack of universal official recognition and sometimes serious legal or military disputes over their territory with neighboring governments, including such would-be states as: The Principality of Sealand, Christiania, the Hutt River Province Principality, Lovely, Whangamomona, the Gay & Lesbian Kingdom of the Coral Sea Islands, the Kingdom of Elleore, the Order of Malta, Akhizvland, the Northern Forest Archipelago, Seborga, the Principality of Freedonia, and the Great Republic of Rough and Ready. The second part consists of those micro nations which have made the backyard of the nation’s founder to be an independent realm, including such states as: the Republic of Molossia, the Copeman Empire, the Empire of Atlantium, the Kingdom of North Dumpling Island, the Rpublic of Kugelmugel, the Grand Duchy of the Lagoan Isles, the Principality of Vikesland, the Great United Kiseean Kingdom, the Kingdom of Romkerhall, the Ibrosian Protectorate, the Sovereign Kingdom of Kemetia, Talossa, the Aerican Empire, Cascadia, the Principality of Trumania, and the Kingdom of Redonda. The third and final section consists of micro nations which have large ambitions, including such realms as: Westarctica, Borovnia, the Maritime Republic of Eastport, the Republic of Rathnelly, the Republic of Saugeais, the Barony of Caux, the Conch Republic, the Kingdom of L’Anse-Saint-Jean, Ladonia, the Dominion of British West Florida, the Grand Duchy of Elsanor, Snake Hill, the State of Sabotage, and a few plans at offworld colonies on the moon. The book includes some discussions of offbeat secession movements including one Emperor Norton of the USA (a historical figure who lived and died in the West and was a local celebrity in 19th century San Francisco) and the efforts of John Lennon and Yoko Ono to live up to the ideals of John’s hit song “Imagine.” The total contents sum up to a little more than 150 pages. Intermixed with the obvious fun and silliness are some more serious aspects. For one, many of the micro nations have faced the problem of longevity, as I found it difficult to find a web presence for some of the micro nations listed here that were active ten years ago. For another, there appeared to be consistent concerns that led people to want to start their own nations. There was the failure of implied social contracts involving the well-being of landowners or pensioners in the face of increased taxation and regulation, there was a hostility to militarism and a desire to promote peace, and there was a feeling that many institutions in nations had failed to serve the common people while making heavy demands upon their loyalty. That said, many of the people who founded their own nations have found ruling their own nations to not be as fun as they may have thought, and ensuring cooperation in many cases has been difficult, while other nations have found enough like-minded people to make a go of it, at least for a few decades, despite the difficulties of attaining some kind of demographic or geographic stability. This is a book that is written for the laughs, and the book features more than a few crazy Aussies (who seem particularly inclined to start their own nations, in part because of low police pensions), and it features a few crazy Floridians and people of the Pacific Northwest, as one would expect, but aside from the laughs, the book is a reminder of the fact that all nations have begun in some like fashion to their own, with people dissatisfied with the status quo or with a vision of a better realm than the one they started in. Such dreams and such dissatisfaction remain, even if many of these imaginary realms are sadly defunct. 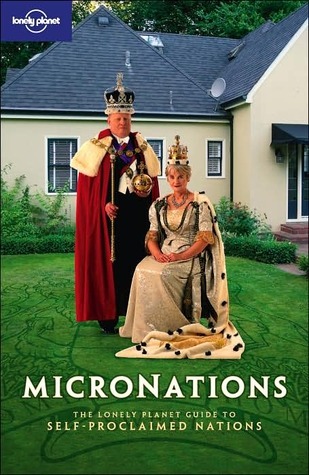 Interesting and well researched little guide about famous (and not-so-famous) Micronations. This Lonely Planet guide will take you to iconic places such as The Republic of Molossia, Christiania and Sealand where you will learn about rather eccentric individuals who decided to secede – some more seriously than others – from the Mother Country and to found their own nation. The guide itself reads much like any other Lonely Planet book, with dedicated sections on the history, geography, population, Interesting and well researched little guide about famous (and not-so-famous) Micronations. This Lonely Planet guide will take you to iconic places such as The Republic of Molossia, Christiania and Sealand where you will learn about rather eccentric individuals who decided to secede – some more seriously than others – from the Mother Country and to found their own nation. The guide itself reads much like any other Lonely Planet book, with dedicated sections on the history, geography, population, attractions etc of each Micronation, the only difference being that you won’t read about any of those places in other travel guides. What a fun little book! This unique "travel guide" is a little compendium of micronations: non-UN-sanctioned states with self-proclaimed rulers. I did a lot of head shaking, eye-rolling, chuckling, and jaw dropping as I read this. Some of it is so bizarre that I thought surely someone had made it up! Well, come to think of it, I guess they did. Some of my favorites were The Republic of Molossia, Aerican Empire, and the Kingdom of Elleore. I don't think I could have read it at one sitting, but it What a fun little book! This unique "travel guide" is a little compendium of micronations: non-UN-sanctioned states with self-proclaimed rulers. I did a lot of head shaking, eye-rolling, chuckling, and jaw dropping as I read this. Some of it is so bizarre that I thought surely someone had made it up! Well, come to think of it, I guess they did. Some of my favorites were The Republic of Molossia, Aerican Empire, and the Kingdom of Elleore. A fun read on an interesting topic. although it's a cute and humorous way to present the information, i kept wishing that the book wasn't set up like a travel guide. really, most of these places none of us are going to visit, and i'm more fascinated with the phenomena than actually visiting. i don't know if there is a more academic version of these micro nations and how they came to be or what causes people to create them, but i'd be interested to read it. A fun little romp through the tiniest nations, the ones that don't even really exist except in the minds of their creators and the agreement of others to acknowledge them. ("Others," in this case, pretty much never includes 'real' nations.) It's hilarious because it's written with a good deal of self-consciousness, in true Lonely Planet style. Sadly, a little difficult to come by. A funny manuel if you ever want to take up a new citizenship. Not strictly for humor, but a good way to laugh and look into future travels. I may or may not have started my own country in my parents' garden after reading this book. Such a fun book. I hope to be hanging out in Whangamomona sometime soon, even with its risqué reputation for billy goat assassinations. An entertaining troll through micro-nations, unfortunately most of the coolest sounding of which are now extinct. I was hoping this was about imaginary countries without actual territorial pretensions. Unfortunately, it turned out to be about countries that are trying to be real, à la Sealand.